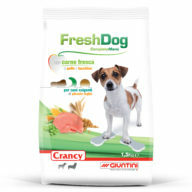 Thanks to calcium micro-granules and minerals it performs an abrasive action that prevents the accumulation of dental tartar and keep clean teeth and healty gums. Bentonite help the cleaning of teeth for its abrasive capacity and intestinal balance thanks to the cation exchange capacity. Crancy dental snack cannot replace a complete food for your dog. Always leave a bowl of fresh, clean water. It should be avoided the simultaneous use orally with macrolides. 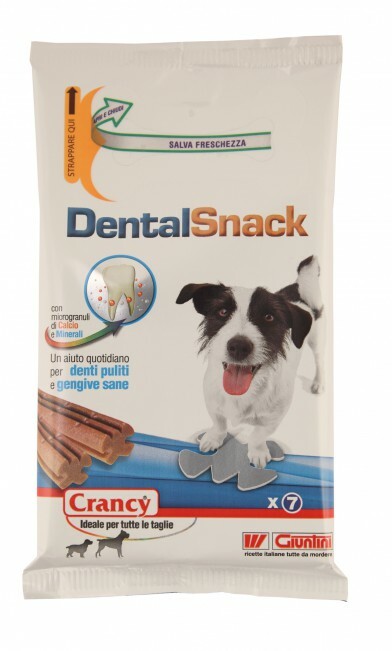 Big (30 kg +): Number of dental snack 1 and half. Cereals, Derivatives of vegetable origin, meat and animal derivatives, oils and fats, minerals, sugars. Moist: 16%; Crude protein: 16%; Crude oils and fats: 3%; Crude fibres: 0,8%; crude ash: 5,5%; calcium: 1,6%. Preservatives, 1m558i Bentonite 15.000 mg/kg. 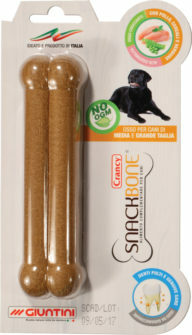 Crancy SnackBone is a complementary food for Medium-Large breed of dogs.